Listed below are some of the best web sites for Baby Boomers to find jobs, even your retirement job. Then down in the middle of this page you may use our job search to find jobs in all locations and job categories. Then on the lower part of this page are US Employment statistics for national, state, county and top 50 US cities that you may find interesting. Before you can get a job, you must be looking for one in the places where people are posting jobs. The following sites are helpful especially to people with a long career who are wanting to fill a niche within the work force. Have a look at these websites. They could very well be the site you find your next position. 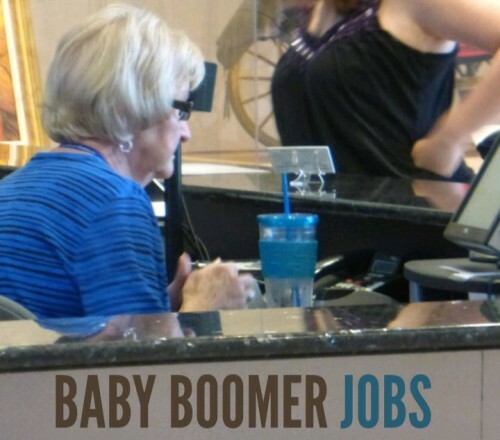 Here is info on Baby Boomer Jobs. RebootYou.com — RebootYou is a blog focused on the concept of “rebooting” your life for whatever comes next. This site has lots of valuable information for people who want to “reboot” their life and start fresh. It also has stories of people who’ve done this very thing who came from all different backgrounds. Workforce50.com — The slogan “No Pastures Here” pretty much says it all. Workforce50.com’s career site is targeted to mature workers searching for employment, making a transition, or approaching retirement. With a job force full of listings by companies wanting to hire people who are 50+ years of age, this site is a must visit for seniors looking for a new position in retirement. ExecuNet.com – for the Executive-level person, ExecuNet strives to connect executives with new jobs and recruiting firms looking to hire executives. While the job board is 100% dedicated to executives and upper-level employees who make over $100,000 per year and up, there is a lot of content geared toward people who want to get to this level. YourEncore.com — YourEncore is a niche job site targeted to retired and veteran scientists and engineers. The professionals that get accepted by YourEncore become “Experts” who get paired with clients who need assistance from experienced professionals. Accepted profesionals are able to reject projects which don’t interest them so this means that you can be “retired” while still working on things that interest you. To get started as an Expert, visit the site and fill out a profile for YourEncore to look at. ENRGE.us — The Employment Network for Retirement Government Experts (ENRGE) website is a website for government employees or those within 12 months of retirement to get their resume out there so ENRGE’s network of government vendors, private equity managers, VCs, human resources departments and business owners can hire and find someone who can help them with whatever project they happen to be working on. RetireeWorkForce.com – RetireeWorkForce’s niche is showcasing unique part-time, flexible, seasonal and full-time positions that aren’t found anywhere else. On top of the job search and resume-building services, RetireeWorkForce has what they call “RW University” which is a program with 130 classes taught by instructors or self-administered that give certificates. RetirementJobs.com – Only 5 years old and founded by former Fortune 1000 human resources executives, RetirementJobs.com locates companies that want older workers and pairs them with active, efficient, punctual, and mature adults who want a job to match their lifestyle. It’s free to search for jobs though a premium package is offered which gives the user access to special members-only content and classes. Nice and informative site for jobs. I had no idea there were so many places to search job websites specifically for us Baby Boomers. Being retired is nice but you never know when you need a little extra money! This is a great list of locations to find jobs for baby boomers! However, I want to emphasize that they are able to look in the same places as the younger generation. Just because you are older doesn’t mean job searching should change at all! great post for job seekers and thanks for the tips . sometimes i really need a push and this post did just that. Just wanted to give our opinion about boomers finding work when you are over 60.We are trying to live on s.s. and have both filled out at least 25 app each.He has 50 yrs exp in food business and i 25 yrs cashier.The fresh mkt in jupiter looked down their noses at us as if to say,you must be kidding looking for work at your age.The harbor side resturants in jupiter did the same.Another place was home depot,wallgreens,career resources sent out several resumes and still nothing.Publix where i worked for 10 yrs hired young kids and cut our hrs . Baby Boomers Job seekers are looking for job updates in various web portals, I appreciate for updating various job vacancies in single point. List given in article will be helping many of them looking for Baby Boomers Jobs. A good list of specialist sites for people to refer to, if people want to work and are fit enough to do so, why shouldn’t they? However, I do agree with the poster above, that the baby boomer generation should have every right to apply for mainstream jobs too. If you’re not having much success finding a job, it may be your CV/resume that’s letting you down, rather than your age. Finding work in this economy can be challenging. We’re starting to see a transition away from long-term employment to job-hopping and part-time employment. It’s important that people see the alternatives to traditional jobs. I highly recommend that people look into doing online freelancing or other alternate money-making opportunities. It’s also worth mentioning that baby boomers are still able to look for employment the same way that everyone else does. Sure, these specialist sites and resources are a great help, but it’s definitely a good idea to use regular job boards and such too.